Rectangular dish with cover. Backstamp: Reg. No. 623294 This pattern was introduced by William Adams in 1780 being a copy of a Chinese pattern and one of the first of its style produced in English pottery. Wm Adams. The base is crazed and discoloured and UNDER the rim there is a small chip to one corner and a slightly larger one to another. The cover has a little discolouration around the foot rim otherwise is in excellent condition. Rectangular dish with cover. Full pattern to the cover with border pattern only to the rim of the base. Backstamp: Reg. No. 623294 This pattern was introduced by William Adams in 1780 being a copy of a Chinese pattern and one of the first of its style produced in English pottery Wm Adams England. There is a little wear and discolouration to the inner rim of the base and discolouration inside and under the rim of the cover. Backstamp: Landscape Adams Est 1657 England. The base has discolouration to the inner rim, and the cover has some under the rim and a little to the handle and the top rim. Overall a lovely dish. Superb wedge-shaped cheese dish. Slight crazing to the glaze of the cover, otherwise both stand and cover are in lovely condition. One of the best examples we have seen. 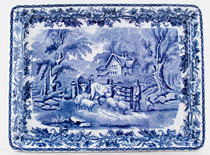 Typical blue printed backstamp Landscape, Adams. This pattern is normally known by the name India, but whether that was the factory name for it or a later given name is uncertain. It is a Chinoiserie riverscape scene. With gilt rims and gilt highlights to the finial. 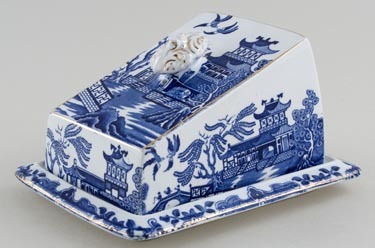 A substantial ironstone cheese dish in as yet an unidentified chinoiserie pattern. The background of the cover is turquoise but the base background is white. Backstamp: Impressed Ashworth and in script pattern no. B3392 The gilt rim on the base is a little worn and also the gilt to the finial on the cover. The finial also has a firing fault and a few signs of wear. The turquoise background has a little minor wear. A lovely stand printed in a rich flow blue. Backstamp: Siam B & H. Light all over crazing with just a little very minor discolouration, mainly to the foot. Overall excellent condition. This is absolutely gorgeous. Both base and cover beautifully patterned. Backstamp: Impressed and printed Caduceus Bisto England and in script 4 2033. There is a little minor wear underneath the base and under the rim of the cover otherwise excellent condition. From outside it shines like new. Base of cheese dish, makes lovely tray or for hanging as small wall plaque. This is a large substantial base of a cheese dish, but makes an excellent display or serving piece on its own. The fabulous rural scene is surrounded by a grape vine and wheat border, all printed in a light steely blue. Backstamp: British Scenery Booths Silicon China Made in England and impressed Booths. Light all over crazing with some bubbling of the glaze, overall excellent condition. 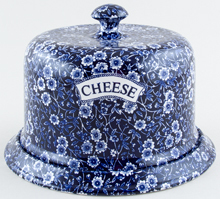 A cheese dish of magnificent size and decoration. The handle to the cover has beautiful moulding and gilt decoration and there is gilt line decoration elsewhere. The base has fine crazing to the glaze, but is not stained and the gilt to the rim is well-worn, with only small amount remaining. The cover is virtually as good as new, with just a little wear to the gilt on the rim on the corners. This is an early example of Booths Dragon with a blue printed backstamp Booths over a crown with Silicon China and England beneath. Today a rare and desirable item. Blue printed under the glaze with hand applied enamel colour and ochre rim. The base of the dish is beautifully patterned all over and is in excellent condition. The cover has some light crazing and a little discolouration under and inside the rim otherwise excellent. All in all for a cheese dish really good. With gilt. A fabulous cover only with ornate handle. No backstamp. Light all over crazing with a little wear on the top and to the gilt, a little discolouration underneath and small hairline inside which does not go through. With gilt. Backstamp: Booths Silicon China Made in England Real Old Willow. Date of manufacture probably 1925-30. On the base the gilt is worn and there is a little staining. The cover has a discreet hairline to the cover and a little staining under the rim and inside. Overall a lovely dish. Provenance: The Entwistle Collection. With gilt. Fabulous dish with ornate handle to the lid highlighted with gilt. Backstamp: Booths Silicon China Made in England Real Old Willow. There is a little wear to the gilt and the lid is crazed otherwise excellent condition. With gilt. Backstamp: Booths Silicon China England Real Old Willow. Date of manufacture probably 1916-17. Large dish which is crazed and there two tiny hairlines inside the base to two of the corner but they do not go through. Overall a stunning dish. Provenance: The Entwistle Collection. Lovely dish in this pretty floral pattern. No backstamp. The base has light crazing with a little minor wear to the outer rim and underneath a tiny manufacturing fault. The cover is also crazed and inside has a little discolouration. Sounds far worse than it looks! Gorgeous dish in this pretty floral pattern. Backstamp: May Blossom Leighton Pottery B & L B. The base is crazed and stained mainly to the centre and underneath and a little around the rim. The cover has some discolouration underneath but from the top shines like new. Made by Zachariah Boyle of Hanley and Stoke active 1823 to 1850. This scene believed to be Kirkstall Abbey, Yorkshire a delightful view with a pretty floral border around the rim and the foot. Some light surface scratching to the face and a hairline running around the inside of the foot where it joins the stand. Minor wear to the rim. Sounds worse than it is, a lovely piece! Lovely dish in a bird and floral pattern. With gilt although this does show some signs of wear. Cover and base completely covered with the pattern. Both pieces with crazing but this does not detract from this super dish. Originally introduced about 1913 as Chinese Peacock, but later known as Blue Bird. Backstamp: Burgess and Leigh Burslem England. The base is crazed and stained and has a hairline to the rim. The cover has light crazing and a little discolouration to the rim and the shoulder and also the the should rim there is a tiny tiny nick. Originally introduced about 1913 as Chinese Peacock, but later known as Blue Bird. Backstamp: B & L Burleigh Ware Burslem England. The base is crazed with some staining. The cover has a little discolouration under the rim and a small minor manufacturing fault under the central knop otherwise excellent condition. Burleigh with gilt. Lovely dish with strap handle to the cover, highlighted with gilt and ribbed detail to the base. Backstamp: Burleigh Ware Willow Burslem England Made in England and impressed Provisional Patent. Light crazing with just a little minor wear to the gilt, overall excellent condition. Burleigh with gilt. Lovely dish with ornate handle to the cover, highlighted with gilt, and ribbed detail to the base. Backstamp: Burleigh Ware Willow Burslem England Made in England and impressed Provisional Patent. Round base with lovely domed cover. Backstamp: Burleigh Ware Willow Burslem England Made in England. The cover is crazed and has a little blue speckling here and there. The base is in excellent condition. Burleigh Willow with gilt. A lovely dish with decorative finial to the cover. Backstamp: Burleigh Ware Willow Burslem England. A little blue smudging to the base and under the rim of the cover a little minor discolouration. Overall excellent condition. Small stand from this well known factory. Backstamp: Impressed B&L with 86 beneath. Three stilt marks to face. A few minor signs of use and age, but overall excellent condition. Made in England. Brand new and first quality, dishwasher and microwave safe. This is a attractive piece either for display or for serving cheese, quiches or flans etc. This item has been discontinued by Burleigh and is no longer available. Made in England. Brand new and first quality, dishwasher and microwave safe. Blue Asiatic Pheasants. This is a replacement cover to fit the base. This item has been discontinued by Burleigh and is no longer available. 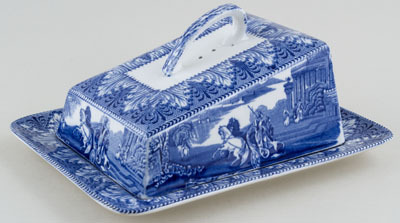 The traditional Stilton shape cheese dish, with a flat base and domed cover. Lovely for display and great in use. Backstamp: B & L Burleigh Ware Burslem England. Minor signs of wear to the base. The cover has a very small manufacturing chip to the rim which has been glazed over, however thanks to the nature of the pattern it is well disguised! Made in England. Brand new and first quality china, which is microwave and dishwasher safe. Dark Blue Calico. This item has been discontinued by Burleigh and is no longer available. Made in England. Brand new and first quality. Dark Blue Calico. This item was produced by Burleigh in a limited quantity and is no longer available. Lovely wedge shape cheese dish with ribbed detail to the base. Backstamp: Calico Burleigh Staffordshire England and impressed Provisional Patent. Minor wear to the rim of the base otherwise excellent condition. Fabulous base and domed cover. Backstamp: Calico Burleigh Staffordshire England. Excellent condition. Lovely dish both cover and base beautifully decorated. Backstamp: Scilla by Lillian Delevoryas Burleigh Staffordshire England and impressed Provisional Patent. Excellent condition, probably never been used. Made in England. Brand new and first quality, dishwasher and microwave safe. Designed by Rosemary Dorling and Artwork by V Trebbick, it features 17 famous British Cheeses in a black and white spiral design. This item has been discontinued by Burleigh and is no longer available. Made in England. Brand new and first quality, dishwasher and microwave safe. Dark Blue Willow. Round base with lovely domed cover. This item has been discontinued by Burleigh and is no longer available. Very pretty stand with floral and butterfly pattern to the centre. It was made by Samuel and John Burton of Burslem, Staffordshire, who were in business from 1832 to 1845. Backstamp: Windsor Group S & JB. A touch of crazing to the glaze otherwise excellent condition. There is no makers mark, but this stand is tentatively attributed to Evans and Glasson of the Cambrian Pottery, Swansea, Wales because of the impressed "Best Goods" a term used by them, but also by other potters. This is a good sized cheese stand which does have some crazing and areas of associated staining, which looks worse in the photograph than in real life. Round base with embossed decoration to the rim and domed cover. Backstamp:Carlton Ware Gourmet England. A few minor signs but overall excellent condition. An absolute delight, a small cheese stand in virtually perfect condition. Three stilt marks, but glaze in sound condition. Usual blue printed mark, with initials C E for Cartwright and Edwards. Lovely large wedge shape cheese dish. Backstamp: Cauldon England. The cover is crazed, has a hairline to the handle where it joins, and a small chip to one corner and another tiny tiny one to the rim. Underneath the base there is a small manufacturing fault to the foot otherwise it is in superb condition. The cover is a slightly steely blue compared to the base. Overall a fabulous dish. With gilt. Backstamp: Cauldon England Est 1774 and in script x18. The base has light all over crazing with the gilt to the rim almost all worn away. The cover has a small chip to the one corner, some wear to the gilt on the handle and a little discolouration inside the rim. It is very slightly too large for the indent on the base. With gilt. Backstamp: Cauldon England Est 1774. Both pieces are crazed with a little wear to the gilt and the cover also has a small chip to one corner. Lovely large stand. Not marked but this pattern is attributed to Davenport. There is some surface scratching and generally a few signs of wear, mainly to the rim, but it is in excellent condition. Lovely stand with quite deeply canted sides and beautifully decorated all over. Backstamp: Spanish Beauties. There is wear and discolouration to the rim and some blemishes and a little minor discolouration to the face of the stand. Fabulous stand with lustre rim and wonderful colours to the bird and floral pattern. Backstamp: Kaolin Ware Aurora D and in script 1/331. There is some wear to the lustre and a little surface scratching, overall excellent condition.